Choosing between medical abortion and surgical abortion can be tricky at times. Women who are economically poor blindly go with the medical abortion option. However, there’s more to just economical bar while deciding the method of pregnancy termination. This blog explains both procedures and helps you make the decision on the method of abortion. 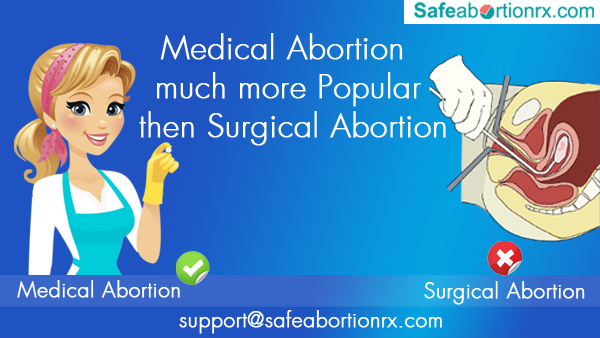 Surgical abortion is a safe procedure of ending an unwanted pregnancy of first or second trimester. Most women prefer this method when they plan to end the pregnancy which has crossed 9 weeks already. In this method, surgical instruments are used to remove pregnancy contents from the body. It is done through either suction or dilation techniques. Surgical abortion is suitable for later pregnancy up to 20 weeks gestation. You can breastfeed during the surgical abortion procedure. Medical abortion is a widely chosen option in the world for unwanted pregnancy up to 63 days of gestation. In this non-surgical method, there’s involvement of a drug combination which involves one pill of anti-hormone medicine and four pills of prostaglandin tablets. Mifepristone and Misoprostol is one such drug combination which can be used in the process of medical termination of pregnancy. When you take the first pill, there’s not much visible difference in the body. After you take the second pill, you begin feeling nauseous. Cramps and bleeding are the two symptoms which you encounter within 24 hours. While cramps can last up to a few hours, bleeding continues until all pregnancy contents are being removed from the uterus. Why should you choose medical abortion? • Most women in the USA and other parts of the world choose medical termination of pregnancy because of the privacy concerns. • The procedure is easy and can be performed at home. If you chose to buy abortion pills online USA , you may not even have to step out of your home during the procedure. • You can buy abortion pills at considerably affordable rates. If compared with the fees of surgical abortion, medical abortion is a cheaper option. • Abortion pills are safe and effective if you buy them from a genuine and reliable pharmacy store. • Almost every woman with a first-trimester unwanted pregnancy can have a medical abortion except when pregnancy is ectopic. • It does not require anesthetic and the procedure is a non-invasive method of ending the pregnancy. • It appears to be a more ‘natural’ process. The experience looks similar to menstrual periods or natural miscarriage. Surgical abortion can make a hole in the uterus. The method also has high risks of infection. On the other hand, the side effects of medical abortion are all temporary and may not require additional medication to treat them, unless they are extreme. That being said, both procedures have their pros and cons. It is the circumstances which make choose between medical abortion and surgical abortion. You can speak to your physician and ask him/her if your body is suitable for medical abortion. If not, you can go ahead with the surgical abortion procedure.